The Full Package is also available. The Full Package does not include the following DLC: Bloodsucker Pack, Unlockable Pack. These are available separately or as part of the Ultimate Franchise Pack. The GOG.com version handles DLC differently from the other versions and is only compatible with other GOG copies in multiplayer. Includes Genkibowl VII, Gangstas in Space, and The Trouble with Clones. Unlocks already available game content. Delete or rename logo_amd_hd.bik and logo_thq_and_voli_hd.bik. 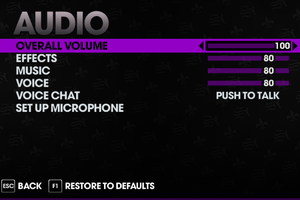 Things To Do In Steelport combines all the best mods from the Saints Row modding community. Includes "Launcher with Advanced Options". Approx. 100 MB available and cross-platform. Use Launcher with Advanced Graphic Options. Key rebinding. All the categories (top) and first section of general (bottom). With Steam version if DirectInput controller is present, Steam wraps inputs from it instead of XInput controller, making XInput controller unusable. Game crashes when disconnecting controller unlike with XInput controller which is hotpluggable. 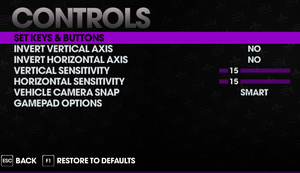 For DualShock controllers use DualShock Button Prompts mod. Steam version with DirectInput controller crashes when disconnecting the controller. Place it in the same folder as the game executable. This issue mostly affects AMD/ATI graphics cards, but these tweaks may alleviate performance issues regardless of brand. Disable SLI or Crossfire if necessary. Disable a secondary monitor in multi-monitor configurations may also help, especially when in fullscreen with DirectX 10/11. If using an AMD Processor with Bulldozer Architecture (FX-4100, 4170, 6100, 8150 etc. 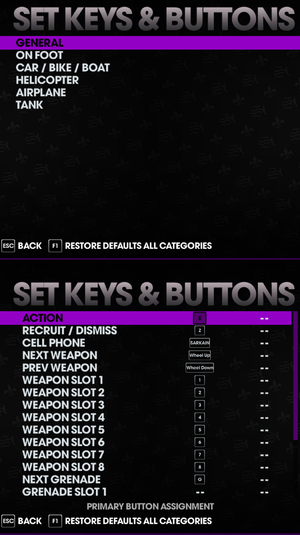 ), use the Orochi-CEG tool. If using a Gigabyte motherboard, update the BIOS from Gigabyte's website. Turn off Hardware Sound Acceleration in DXDIAG (RUN > DXDIAG > SOUND > DirectX Features). If a 7.1 or 5.1 speaker configuration is being used, set it to 2.1 in Windows Audio Options. 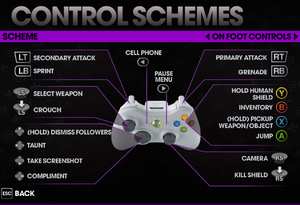 A controller may fail to function or work intermittently, most noticeably on the map screen. Plug in the controller before launching the game. Remove any other devices plugged into USB ports before playing. Should the controller become disconnected mid-game, restart the game with the controller plugged in. This game only supports XInput controllers; use x360ce for other controllers. This is an issue that may occur with Nvidia graphics cards. For non-Nvidia graphics cards, please refer to the equivalent 3D control panel. 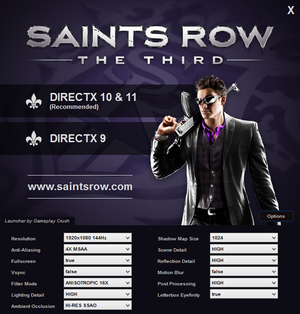 Under the Program Settings tab, select Saints Row from the list of programs (You may need to add it, in which case select Saintsrowthethird_dx11.exe). Change Anisotropic Filtering and Antialiasing to Application Controlled. You may also need to turn off Antialiasing Transparency, Gamma Correction, and Texture Filtering as well. Run the game in DirectX 9 mode. If multiple monitors are used, disable one of them. Make sure the main monitor is in main slot. Exit any program that could mess with the game. Run the game in a different, more common resolution. Start game in DirectX 9 mode and start a new game. After that the game can be switched to DirectX 10/11. 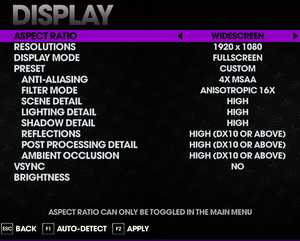 On some Radeon cards, the game may fail to automatically configuring graphics settings. If this is the case, the game will also crash when you try to change display settings in-game. Don't use auto-detect graphics settings in game. The core voltage of the video card could be too low. Raise the core voltage by a little. Warning: Changing settings on your video card may void warranties and can potentially damage the card. If you have Steam installed on an External Hard Drive try moving Steam to an internal Hard Drive. Make sure you have privacy to "Open to all". 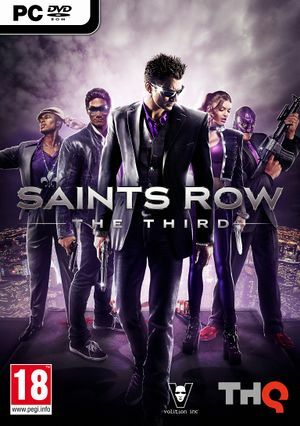 Download Tunngle, sign up for a free account, and join one of the Saints Row: The Third servers. Have your partner download it and join the same server. 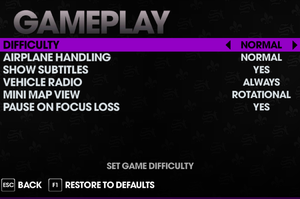 Saved games may be missing despite being in the correct folder, and Saints Row claims there's not enough storage space. This is caused by one player having a much lower frame rate than the other. 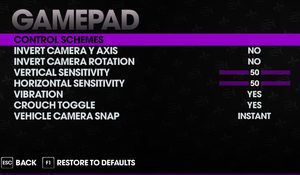 Modify video settings until the framerates are almost even. Loading from a saved game and trying to entering a crib gives a black screen and goes back to the desktop. This may also occur when trying to save a game manually and when killing someone after loading. There may be a conflict between Steam and SRTT. Change the date of your Windows system to the date of the last saved game. Set the affinity of the game to two cores only (max = two physical cores and two related hyper-threading logical cores, if available). Bill's Process Manager is a great tool to manage the affinity (and priority) for games without creating custom scripts or using the task manager each time.